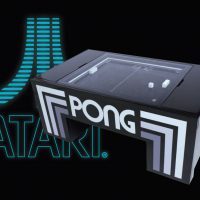 We’re proud to present Pong, a new vibrant and exciting game available for hire as seen at CES 2019. 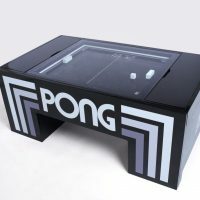 Pong is a colorful retro-futuristic table that combined classic gaming with a modern appeal. 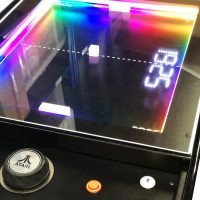 Featuring the traditional square puck, two paddles and a square ‘ball’ that bounces between two players, Pong has all the hallmarks of a classic game updated and brought into the 21st century. Our Pong game is a highly addictive crowd pleaser. Test your reflexes as you challenge your friends to an adrenaline-fuelled one-on-one match, play doubles or get everyone involved and pit your guests against each other to find out who is the ultimate Pong champion. Whether you’re at a party, a Bar or Bat Miztvah or a corporate event such as a product launch, Pong is the perfect way to get your friends, family and coworkers to bond and have lots of fun. 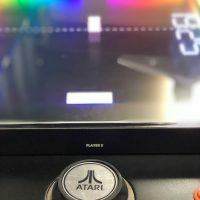 Get nostalgic with Pong Hire. 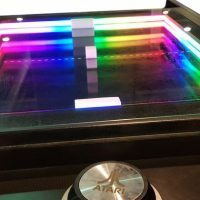 The colourful retro-futuristic aesthetic of the table, with its neon rainbow lighting, is just the thing for an 80s themed retro party. 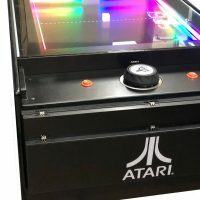 Why not pair the Pong table with Pac-Man, Space Invaders and other retro games for a truly vintage feel? 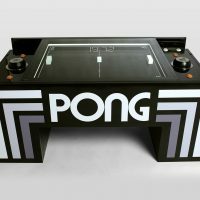 Pong is a practical as well as fun addition to any celebration. The table is a compact size, making it ideal for even parties with very limited room, and the combination of vintage and space age is sure to brighten up your event. If you’d like to see what our Pong tables look like, scroll down and take a look at our Gallery. To find out more about Pong Hire or any of the other exciting products we provide at The Pod Group, contact us and one of our experienced team will be happy to help you find solutions to all your party entertainment needs.